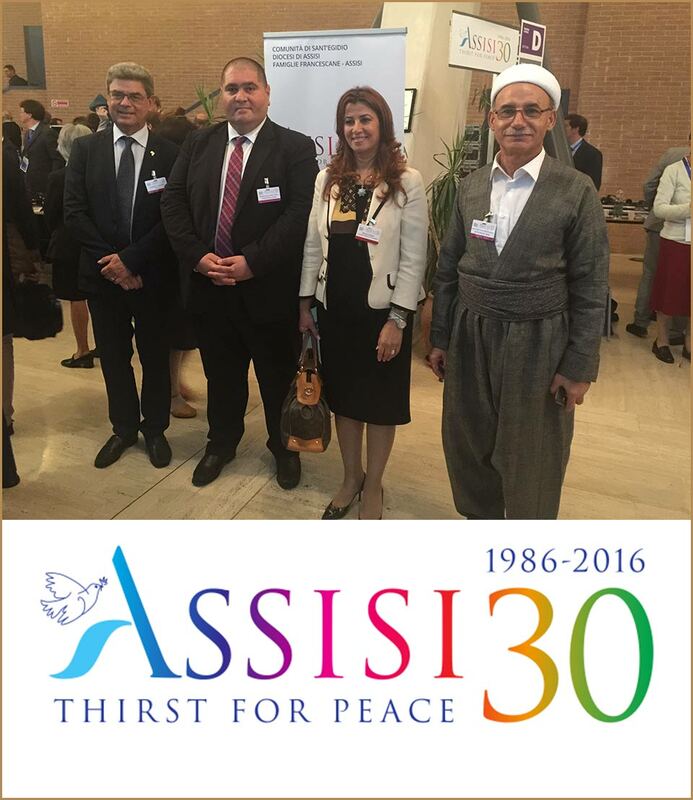 Mrs. Kader participates today to the Opening Assembly of "Assisi 2016"
Was held today, in Assisi, the Opening Assembly of the International Meeting for Peace promoted and organized by the Diocese of Assisi, the Franciscan Family and the Community of Sant' Egidio in collaboration with other movements and ecclesial groups, such as the Umbra Episcopal Conference, the Umbria Region and the Municipality of Assisi. "Thirst for Peace: Religion and Cultures in Dialogue" is the title of the event that will see for three days, until September 20, men and women of different faith and cultures talk, discuss and pray side by side at 30 years after the historic World Prayer for Peace Day on October 27 1986 by Pope John Paul II. The ceremony, which took place in the presence of the President of the Italian Republic, Sergio Mattarella, began with welcome messages by the Bishop of Assisi, Domenico Sorrentino and the President of the Umbria Region, Catiuscia Marini and speeches of the founder of the Community of Sant'Egidio, Andrea Riccardi and His Eminence Bartholomew I, Ecumenical Patriarch of Constantinople, after the greeting of His Royal Highness the Grand Duke of Luxembourg, who was also present at the meeting. After the contribution of the Polish philosopher and sociologist, Zygmunt Bauman, who urged to "develop a cosmopolitan awareness, understanding how to integrate ourselves without separating" spoke the President of the Central African Republic, Faustin-Archange Touadéra and the Chairperson of the National Assembly of the Republic of South Africa, Baleka Mbete. The ceremony then saw the testimony of the Archbishop of Rouen, who recalled Father Jacques Hamel, killed last July by a Isis commando, the Bishop of Rieti, Domenico Pompili and César Alierta, Profuturus of Spain, promoter of a computer education project for young people in Africa. Three religious leaders have concluded the opening ceremony, the Israeli Rabbi Avraham Steinberg, the political adviser to the Grand Mufti of Lebanon Mohammad Sammak and the President of the Japanese Buddhist Rissho Kosei-kai, Niwano Nichiko. For the Kurdistan Regional Government, as well as the High Representative to Italy and to Holy See, Mrs. Rezan Kader, were present Mr. Talia Khalid Jamal, General Director for Christian Affairs of the Kurdistan Regional Government, Omar Hasan Hamad Maro Khoshnaw of the Islamic Sciences Institute of Kurdistan and Leyla Ferman representative of the Yazidi Community, that will participate in a panel entitled " Iraq : Ending the Crisis "
The three days of meetings will end on September 20 in the presence of Pope Francis.